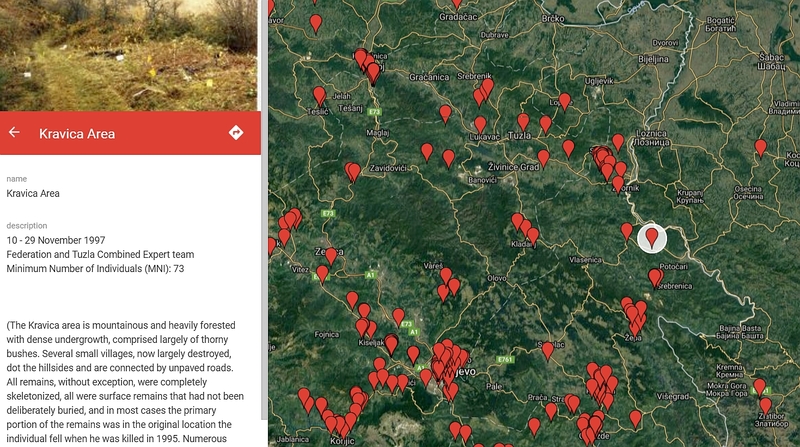 Based on a collection of 137 forensic reports produced by the Physicians for Human Rights (PHR) during its Forensic Assistance Project in Bosnia and Herzegovina in 1997-1999, Blinken OSA published published a map of over 500 individual and mass grave exhumation sites across the country. Complementing the work of the International Criminal Tribunal for the former Yugoslavia (ICTY) and the International Committee of the Red Cross (ICRC), PHR worked with local forensic teams to exhume and document mass grave sites that were not designated for investigation by other organizations, and to collect unique personal information on victims from families and match them with data collected from postmortem examinations. Each Forensic Monitoring Report gives a summary of events occurred at the site and a detailed description of the exhumation process itself, a list of participants and observers (forensics, law enforcement, military, or local media), a description of the grave site and its history and, where applicable, a record of the postmortem findings. Information on the circumstances in which individuals were killed and their alleged status (civilian or military) is also available occasionally. Several color photographs, hand-drawn maps or computer generated site diagrams help visualize various aspects of the exhumation process. The current map uses geographic coordinates included in the reports, as provided by the US Department of Defense. It shows the wide-spread nature and intensity of the Bosnian wars of 1992-1995.